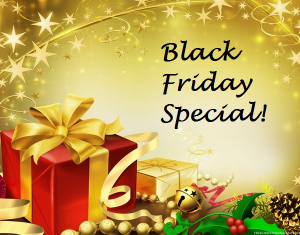 The holidays are upon us, and ResearchTies is happy to announce a Black Friday special! From 12:00 am until 11:59 pm (MST) on Friday, November 28, customers will be able to purchase a new annual subscription for $20 and receive a 30-minute, one-on-one mentoring session at no additional cost. This is a great gift for all of your genealogy friends and family. This year, give the gift of organization. Let’s spread the word and let everyone know about this great offer! Merry Christmas and Happy Holidays from ResearchTies! What does “Family” mean in ResearchTies? When using ResearchTies to track your genealogy research, the term “family” is used to represent the immediate family unit—father, mother, and their children. Add both the husband and wife as individuals. Go to “Add Family” and select the husband and wife from each of the two dropdown boxes. 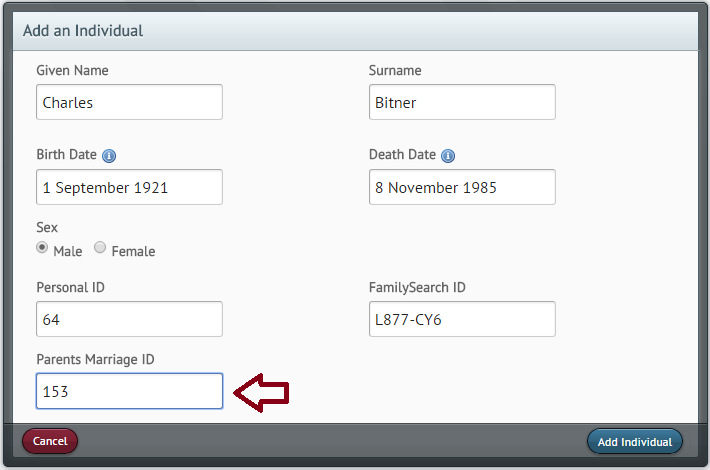 Next, enter the marriage data and the marriage ID number from your genealogical database program (RootsMagic, Legacy, Ancestral Quest, etc.). The children are added as individuals, and they are tied to their parents by adding the marriage ID number of the parents on the children’s individual template. Each family is identified by the marriage ID of the parents, so “adding a family” involves only the process of selecting the two spouses in the “Add Family” template, then adding their marriage data and ID. Whenever an objective or search is created for a family, the user selects the couple who are the parents of that family. On Saturday, November 1, ResearchTies will be holding a two-hour, hands-on lab at the ICAPGen conference to be held at Brigham Young University in Provo, Utah. Come learn how to effectively use ResearchTies to plan, track, and retrieve your research. Click here to register for the conference. (NOTE: Be sure to reserve a seat in the lab for the ResearchTies class as part of your registration process.) Space in the computer lab is limited, so sign up today! In previous articles, we have discussed the process of writing objectives to plan your research. The next step is to find and record the sources that you want to search in order to meet that objective. Locating sources can be a challenge, but there are several places you can begin. The FamilySearch catalog is a listing of all the materials that have been microfilmed or digitized by FamilySearch, and it is possible to search by locality to determine which records are available for a specific place and time. There are also large subscription sites like Ancestry.com that provide a wide variety of records. Programs like GenSmarts can be purchased to make research suggestions, and there are many conferences and classes held by genealogical and historical societies worldwide. The Federation of Genealogical Societies has a listing of almost 500 of these organizations. Be creative with Googling, take classes, read resource books, and enjoy “the hunt” in finding what amazing records might provide new information about your family. After entering an objective into the log, you will be given the opportunity to add a search immediately. If the objective was added previously, search your log to locate the desired objective. Click “Add Search.” In the Add Search template, there are essentially four pieces of information that need to be recorded: the title and author of the source, the jurisdiction of the search, the record type, and the scope of your search. It is also possible to add comments and/or record a Nil search. First, select the source by typing a few letters of the title or author to trigger the dropdown box. Click on the title to be searched, or click on the green add button to add a source that is not yet in the list. When selecting the title, the author will autofill from the source list. If it’s easier to search by author, selecting from the author list will autofill the title. Next, select the jurisdiction to be searched. This may or may not be the same as the jurisdiction of the source itself. For example, a U.S. federal census covers the jurisdiction of the entire United States. If the search will be limited to a specific state only, then the jurisdiction of the search will be that state. As another example, if you are researching an index of county probate records, then the search will obviously include the entire county since they are all indexed in the same listing. In the example of the census search for a specific state, the search jurisdiction will be different from that of the record, but in the case of the county index, the search will be the same as the record’s jurisdiction. Be sure to include the record type for the source being searched. This is important to retrieve this entry in the future and analyze what was found. If you want to analyze all of the land record searches conducted for a specific person, you want to be able to set the search engine to retrieve the data based on both variables. In order to use that power, the information must first be recorded. When planning a search, it is important to record precisely the scope of what will be researched. Will you be looking for a specific person, a family group, or every entry of a surname? Make the appropriate selections in the dropdowns, but also notice that there is a field for additional scope details. Sometimes a search is limited beyond the people and jurisdiction. For example, if a record series covers 200 years, it will be wise to limit the time period of the search. Be sure to record the years to be searched. This is important in the analysis stage of research, because you may discover in the future that the event occurred earlier or later than originally anticipated. If the time period of the search was recorded, you will know whether it might be productive to return to that source. At every step, ResearchTies allows the recording of any desired comments. This field is optional, but it’s a place to put information relevant to the search, either before or after it has been completed. If the search yields no results, return to the search template to record the date and check the Nil checkbox. This month’s tip: Think Retrieval! The most important concept in using databases is to think about retrieval at the time you are doing the data entry. How do you want to retrieve the data in the future? If you want a search to be shown in a list selected by record type, be sure to include the appropriate type at the time of data entry. Several customers have asked about whether they should record birth, marriage, and death records as vital records or separately as birth, marriage, or death. To answer that question, consider how you want to retrieve the entries. To see all vital record searches in one list, categorize them as “vital records.” To see only the birth entries for analysis purposes, without seeing the marriage and death records, categorize each one as a separate type. Another example is when a source will be searched for more than one surname. It is possible to put additional surnames in the “comments” field so that the search is entered only once, but if you want to be able to find that entry by surname in the future, create a search entry for each surname. That way, the search engine can retrieve exactly what you are looking for. Yes, this means that the search is input three times if you are searching for three surnames, but this process only takes a few minutes, and you will forever be able to find all three entries according to the surname you want to report and analyze. Think retrieval, and your data entry will be higher quality and you’ll be much more pleased with the ability to find the information again in the future. Today, we are announcing a new expanded objectives report format. 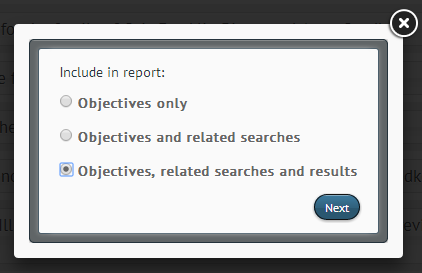 It is now possible to select one or more objectives and create a report including all of the related searches and results. As with other reports, this format can be saved as a PDF file or exported to Excel®. Set any desired terms to narrow the search, or leave the default settings to return a list of all objectives in the log. Click “Search.” In the list that is returned, click on the check boxes to the left of each objective to be included in the report, or click “Select All” in the upper left corner of the screen. Make a selection, then click “Next.” Choose PDF or Excel format, then click “Create.” The report will be generated instantly. This new format can be created for a single objective, several selected objectives, or every objective in the log. The PDF and Excel files can be saved on your computer hard drive, and all hyperlinks are active. Track your progress on each goal that has been set, using these reports to assist in the analysis process. Try it today! The testing committee of the International Commission for the Accreditation of Professional Genealogists (ICAPGen) has approved the use of ResearchTies research logs in applications for Accredited Genealogist® testing. Record your research completely yet rapidly, knowing that this tool will help you meet professional standards. You can use ResearchTies with confidence! To create a report in ResearchTies, you will first need to find and select the data to include in the report. Begin on the home page by clicking on “Search Your Log,” or click on the Search icon on the blue toolbar (magnifying glass). In this case, we want to create a report for results of our research, so click the “Find” dropdown and select “Results.” In the template that opens, set the variables according to the results you want to see. For example, I can ask to see all the results that I have for a specific person. 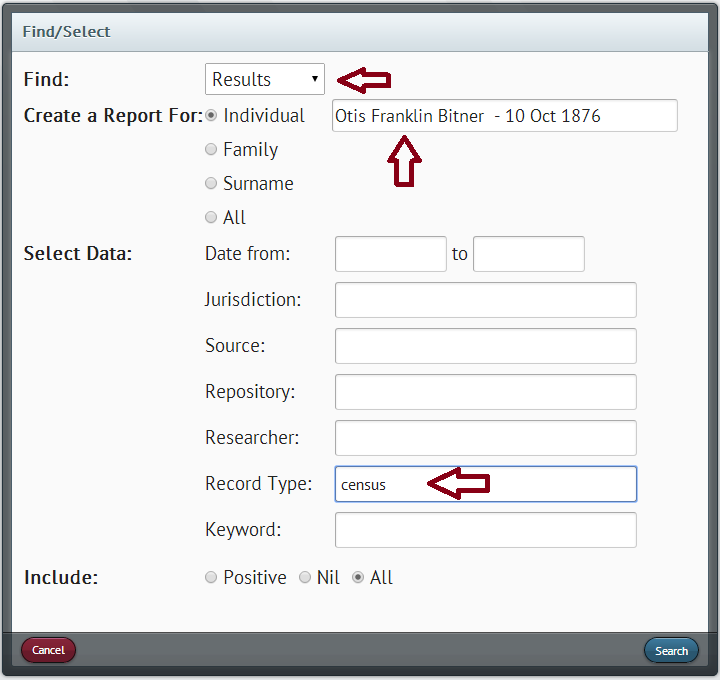 To do this, I would select the person in the “Individual” dropdown box and click “Search.” If I’m focused on finding Otis Bitner in the censuses and want to see if I have them all, I would select “Otis Bitner” in the “Individual” dropdown, then select “census” for the record type. The list returned would show the census records that have been located for Otis, making it easy to see if any have been missed. By default, the template is set to return all Results. Each variable added on the template will continue to narrow the list that is returned. It is possible to see all results ever recorded in the log, one very specific entry, or the full range in-between. It just depends on which variables are set during the search. After clicking on “Search,” a list of relevant entries will be returned. To create a report, it is possible to continue narrowing what will be included in the report by clicking on the checkbox to the left of each Result you want to include. If the list is already exactly what is desired, click on the blue “Select All” button in the upper left corner of the screen. You will see all entries checked. Then, click the blue “Report” button at the top of the screen. You will be given the choice to create the report in PDF or Excel format. After making the selection, click “Create.” A PDF report will open or the Excel file will download. Click on the downloaded file to open it. Reports may be generated for many different purposes. Notice that the links in the reports are active hyperlinks. Sending an electronic copy of the report to a family member or client allows them to also click the links and see the documents in your log. All files uploaded to the ResearchTies server will be available, but URL links to websites will depend on the site’s permissions and whether there are subscription requirements. We highly recommend that all documents be downloaded or saved as a screenshot on your hard drive. Then, upload the file to ResearchTies for preservation, as well as the ability to share your research with others. Uploading is done through the “Add File” function when recording the results of your research. The heading of the report will include the date and any variables that were set when creating the report, so the user will know what was selected. ResearchTies is pleased to announce a new feature which has been added to the site. When creating a report for objectives, searches, or results, users will be given the option to save the report in PDF or Excel® format. Since Excel is an editable format, it’s important for users to remember that editing the Excel file will not make those changes on the ResearchTies server. Always do your editing in your online account, then rerun the report and save the updated copy. A new PDF file has been loaded to the Learning Center to help new users become familiar with the program and get started on their data entry. The information in this document will also be helpful to those who have been using ResearchTies for awhile, but have not had time to explore the full program. We continue to work on the creation of the site’s Help Center, so watch the blog for an announcement when it is finished.